Vermicomposting at home is one of the easiest ways for a person to divert organic waste from landfills while at the same time creating a nutrient-rich soil amendment for your home garden. 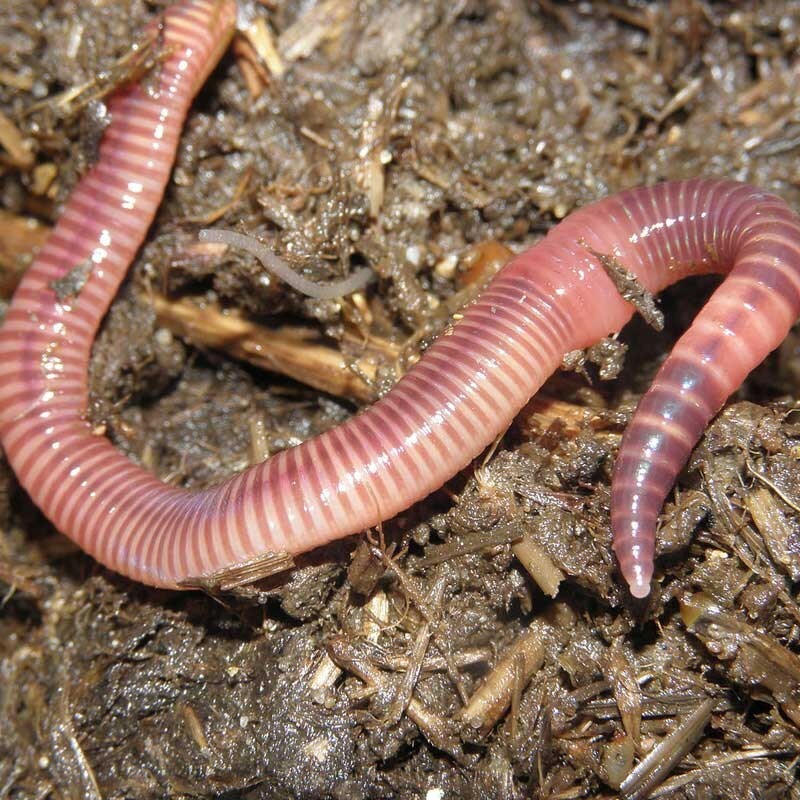 Earthworms have been ploughing soil since the beginning of time. Different worms serve different purposes, but what they all have in common is they eat decaying organic matter. As it passes through their bodies, they help break it down. Their manure, which are known as vermicast, are a great addition for any garden. And, as they burrow into the soil, they aerate the soil, while helps create a great environment. Most people start out with There are thousands of types of earthworms, but for the purpose of vermicomposting, we are going to focus on just one type: Eisenia fetida. Also known as red wigglers, these worms are commonly used as fishing bait. They are ideal for vermicomposting because they are surface-dwellers, never burrowing more than six inches below the surface. As a rule of thumb, red wigglers require about square foot of surface area for every pound of worms. Their eating capacity varies based on the type of food and other conditions, but one pound of worms should be able to eat about their body weight in food per week. Before building a bin, it is recommended that you weigh your food scraps each week to get a better idea of how much surface area for processing you will need. 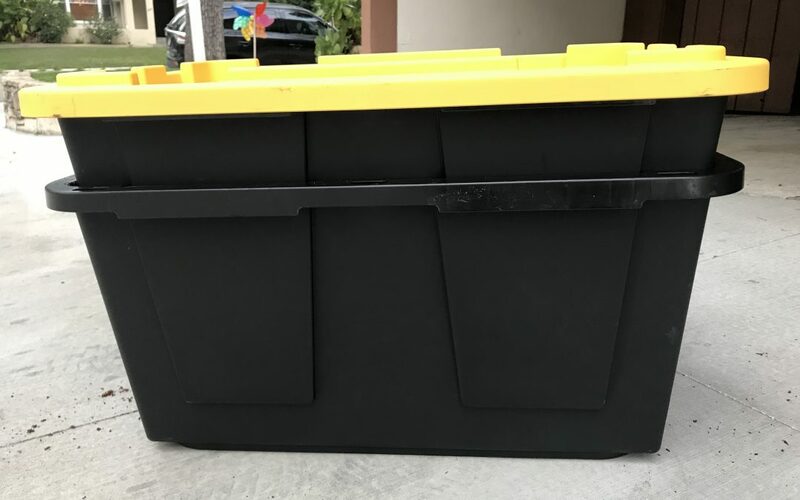 My first worm bin was made from a 5-gallon Rubbermaid Roughneck container. It had a maximum capacity of maybe one-and-a-half worms. It worked fine, but I wanted to increase the number of worms in my bin, so I upgraded to a 27-gallon container. 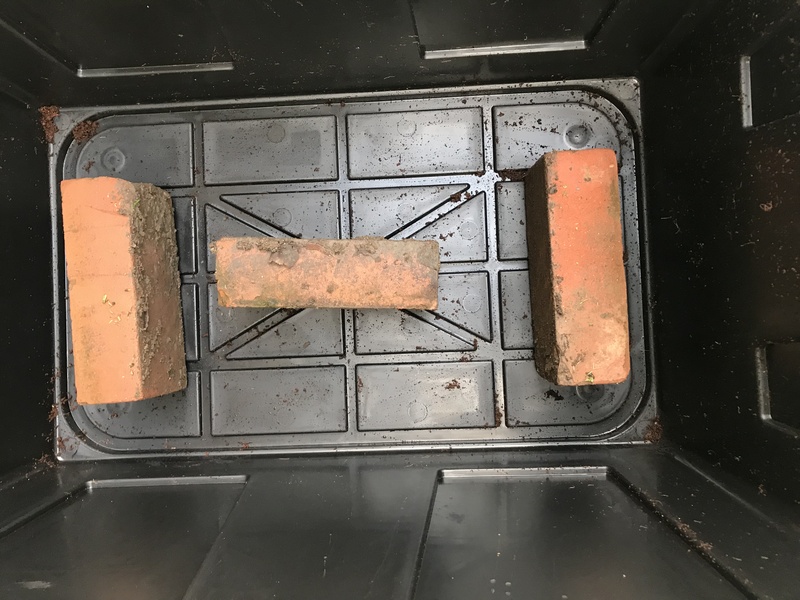 Drainage and airflow are key to the success of your worm bin. Too much moisture and not enough airflow lead to anaerobic conditions which are toxic to your worms. The bottom bin is used to collect leachate and any excessive moisture. 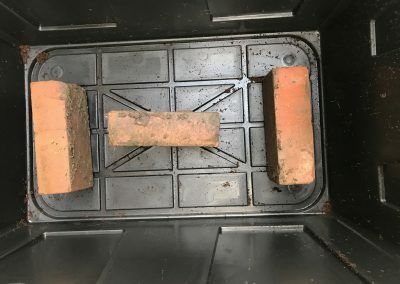 Place two or three bricks, blocks or wood pieces on the bottom of your bottom bin. 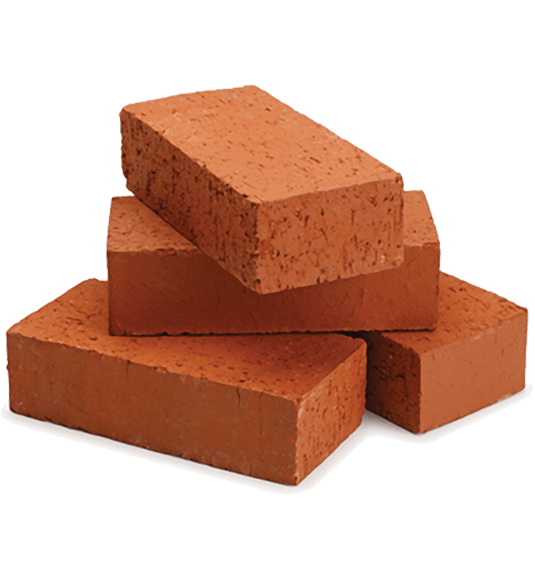 Bricks work well because they are exactly the same size. 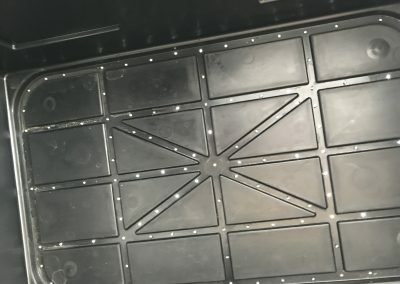 It is important to leave at least a few inches of space between the top and bottom bins for the accumulation of liquid. You can now set aside the bottom bin. You won’t need it until the top bin is ready. As I have mentioned previously, airflow is a key component for your worms to survive and thrive. 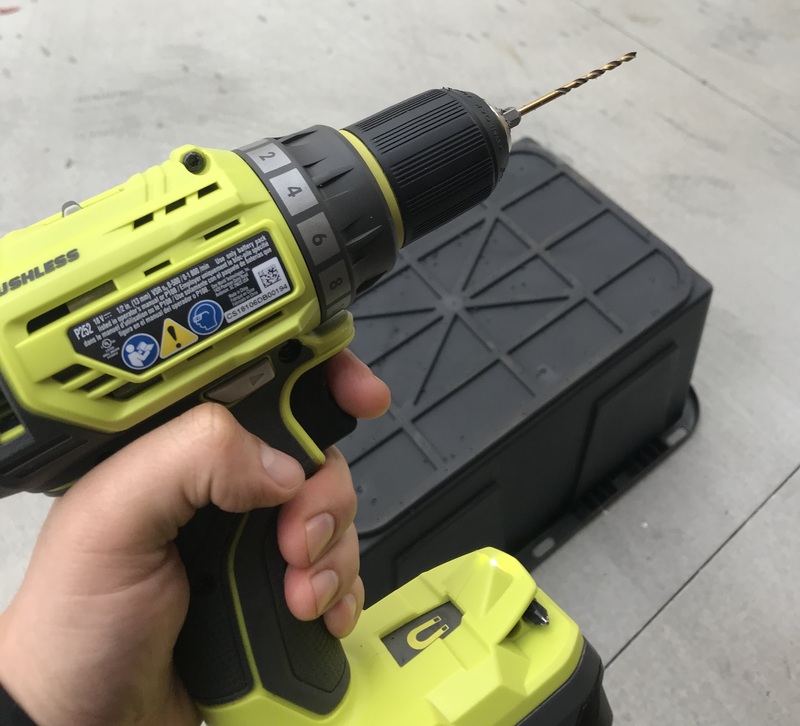 A power drill is not required to make your bin, but it will make the process much easier. Drill 1/8” holes every two inches all along the bottom of the bin. 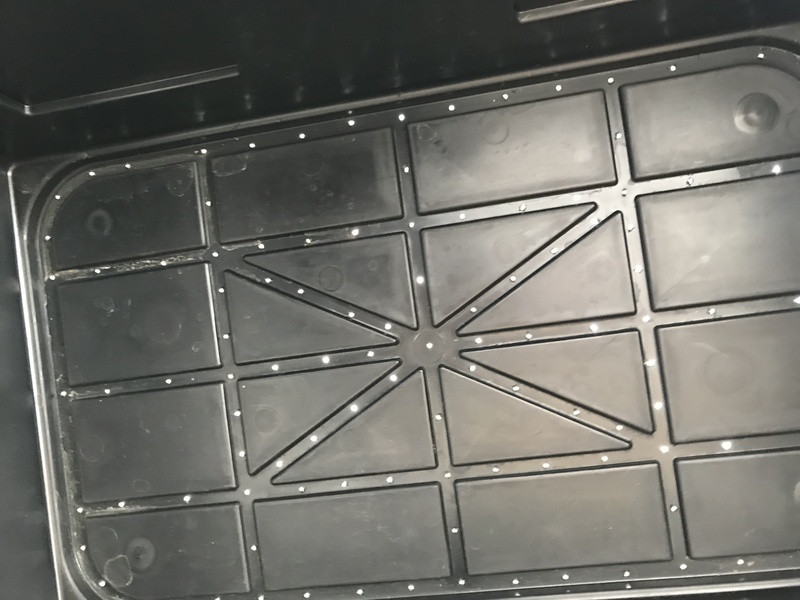 These tiny holes will allow liquid to flow into the bottom catchment bin, but should be small enough that your worms won’t wiggle through them. Larger holes will maximize airflow, which will cause the top bedding to dry out quickly, which will potentially require you to water more frequently than with smaller holes. Pests and vermin will be able to gain access to the bin with larger hole. 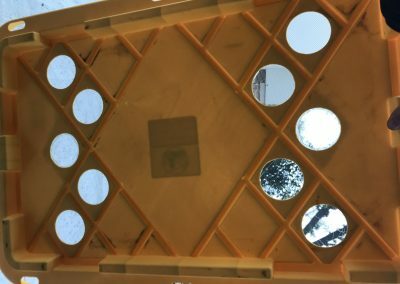 If you decide to make larger holes, such as the ones on my lid, I recommend covering the holes with screen door material and some glue. 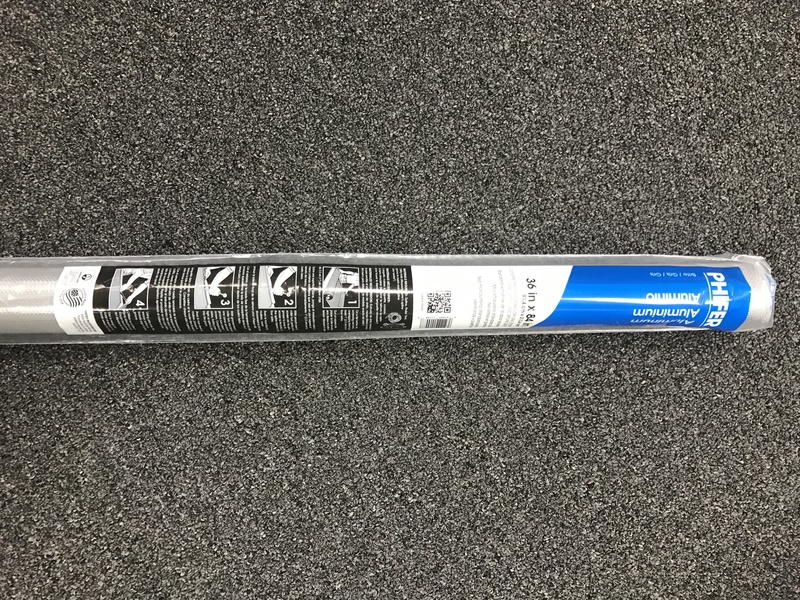 Roles of replacement screen door material are inexpensive and available at any hardware store. Now that your bin is ready to go, there are a number of materials that can be used as bedding. Leaves, for example, make great bedding. Their sturdy structure makes for a great home for worms, providing them with shelter and air flow. 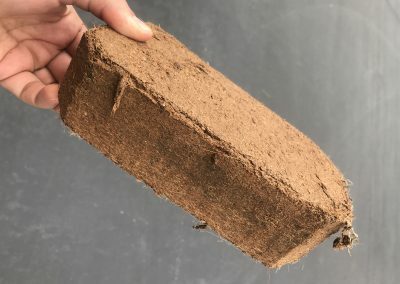 I have also great luck using coconut coir (pictured), which is a byproduct of harvesting coconuts for their juice and meat. Anyone who has cracked open a coconut knows just how hard the outer shell and husk are. Coconut coir is that outer material that has been ground down into much smaller fibers. Once adequately hydrated, your coir will make consistent, fluffy bedding. As I mentioned previously, red wigglers only need four to six inches of bedding to thrive. 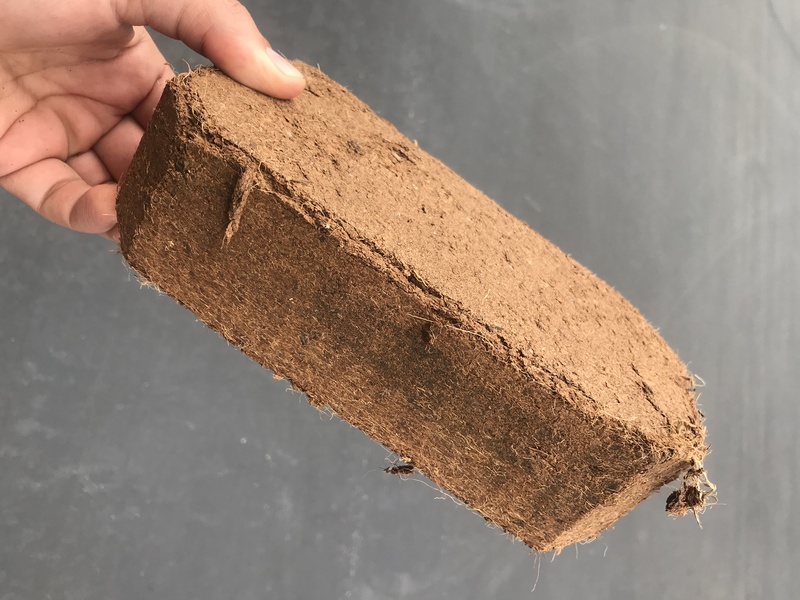 To prep your coir, it is recommended that you use a container, such as a 5-gallon bucket from Home Depot. Place the coir in the bottom on the bucket, then add enough water to cover it. You can either wait patiently for it to absorb the water, or help it but pulling it apart. Once the material has the moisture content of a wrung-out towel, it is ready to go into your bin. The size of your bin will determine how many coir blocks are needed. Leaves, grass clippings and other materials for the natural world will bring adequate microbial activity to your bin that will help your worms thrive. If you decide to go with coconut coir, it is important to add at handful of leaves or healthy soil to jump start your bin. It is also important to note that worms have tiny mouths and no teeth. Adding some sand or finely ground egg shells will provide them with grit that will help them process their food. Food can be added in whole pieces, but it is recommended that you use soft foods or foods that are finely chopped. Worms seem to have no trouble, and in fact greatly enjoy eating melons, but struggle with the rind. Chopping it into tiny pieces will allow it to get moldy, break down and soften more quickly, which will increase their capacity. Red wigglers can be purchased online and typically run about $30 per pound. They reproduce quickly, so starting with a half- or full-pound of worms should be sufficient to get you started. I would also recommend looking for a local worm breeder prior to buying them online. You can also see if your local government agency supplies them. The County of Los Angeles, for example, sells worms to its residents as a subsidized rate of $10 per half-pound. It will take some trial-and-error to get your worm bin dialed in. Worms are fairly robust, but are sensitive to a few conditions. They prefer an environment that is free from direct sunlight and kept between 55 and 80 Fahrenheit. When it gets too cold, they will ball up for warm and not eat very much. Place them in direct sunlight too far above 80 degrees and they will dehydrate and die. Start small and feel them out. My worms have been thriving for years, all thanks to a little patience and some persistence. 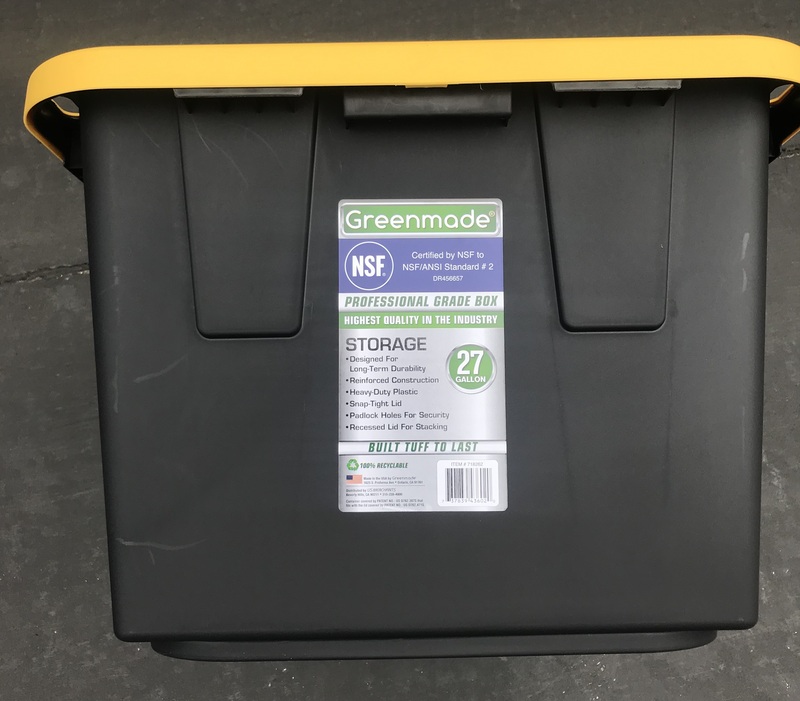 If you decide to use this guide to setup your first worm bin, please let me know how it goes! 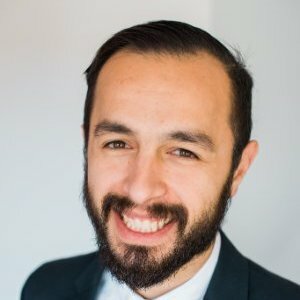 Jonathan Levy is an environmental consultant and social media influencer. When he isn’t working with businesses on ways to reduce waste, you can find him spending time with his red wigglers…all 4000 +/- of them!